135'0" by 82'1" by 32'2"
Four 2200 hp (1640 kW) Wright R-3350-23 Duplex Cyclone two-row eighteen-cylinder radial engines driving four bladed propellers. The Dominator was insurance for the B-29 program, which looked to be in serious trouble in 1943. 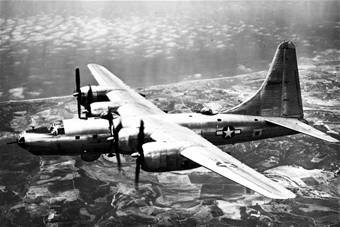 It was a derivative design based on the successful B-24 and was both less ambitious and (it was thought) less risky than the B-29 project. However, the project bogged down when the twin stabilizers of the prototype were found to produce serious stability problems, forcing a redesign with a single large stabilizer. The bugs in the B-32 were eventually worked out, but only 118 Dominators were built. Fifteen of these aircraft saw limited service over Japan late in the war, and actually flew the last combat mission against Japan.